How to reach Pandavkada Waterfalls Kharghar? Monsoons have already set in and there is greenery everywhere, making it the perfect time to explore the real beauty of Navi Mumbai. Green vibrant hills, cloud-laden skies, waterfallsgurgling all around you – there is no better way to spend a day in the lap of nature. Pandavkada in Kharghar is one such place where waterfalls burst forth, spreading gleeamongst all those who visit the place. The lush green Pandavkada hills are visited by people in large numbers who throng here during the monsoon for its majestic waterfalls. It’s proximity to the railway station ensures many visitors, sports enthusiasts and leisure seekers alike, who come to trek, cycle, rappel or sometimes just sit amidst the low hanging clouds. Not only that, it also lies in close proximity of Central Park, a golf course and the up coming ISKON temple. Owing to these places of interest, it proves to be a great splash for those in need of a holiday, but have only a day or two to spare. 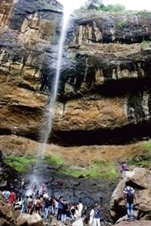 Pandavkada Waterfalls can be easily accessed by roads ,trains and car. Kharghar is in Navi Mumbai and can be accessed to Harbour route. Catch up a train from Mumbai CST from the Harbour route and with one and half hour you are at Kharghar. As soon as you get down at Kharghar Station, take richshaws which will take you to the waterfalls. You can also get down at Nerul Station and take up a bus or taxi. You can also take up local train from dadar to reach kharghar. The Bus route is more comfortable option than train, as there are several KDMT, NMMT and BEST buses plying regularly connecting Navi Mumbai with various cities like Kalyan, Thane and Mumbai. The latest A/C Volvo buses are very convenient and comfortable on these routes, though they charge a little more than the regular buses. The few NMMT buses that ply to Kharghar include 26 (from Thane), 29 (from Thane), 44 (from Dombivli), 52 (from Taloja), 53 (from CBD), and 54 (from Ghansoli). The BEST buses that connect Kharghar with Mumbai include 504 (from Vadala), 503 (from Sion) and AS – 503 (from Wadala). Kharghar is easily accessible from Pune, since it is located on the Mumbai – Pune Highway. The best route by road from Mumbai to reach Kharghar in private cars or vehicles is to take down the Sion – Panvel Highway. The best season to visit is during the monsoons and soon after monsoons, when the rain isn’t too much. 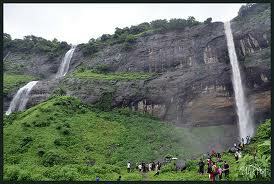 The waterfall is frequented by visitors between June till early September when the waterfall is at its glory. If you are planning to visit it with your family sunday will be the best day for it. On other days there are college groups from nearby colleges who visit it frequently and in large numbers. This entry was posted in One Day Picnic, Travel, waterfalls near mumbai and tagged Family, leisure seekers, majestic waterfalls, Mumbai, nature, One Day Picnic, Outings, Pandavkada waterfalls, Pandavkada Waterfalls Kharghar, Picnic, Travel, WaterFalls, waterfalls near mumbai. Bookmark the permalink.